Chemokine primary structure. 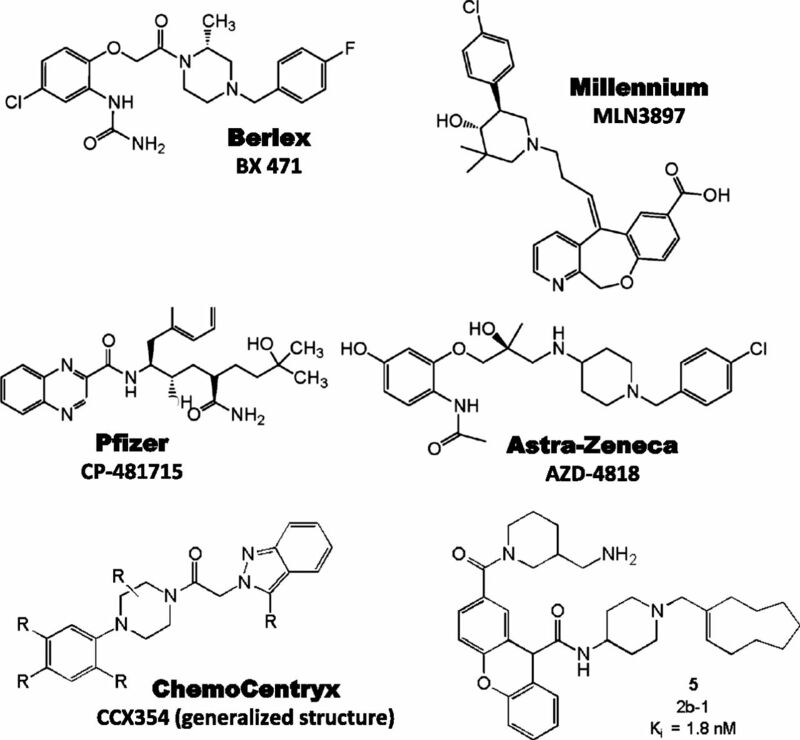 Chemokines are defined by structure, not function. They are >20% identical for any pairwise protein sequence comparison, and after processing most are 70–80 amino acids long. Four subdivisions are named according to the number and spacing of conserved N-terminal cysteines, as shown; all but three of the human chemokines are in the CXC and CC groups. The cysteines form disulfide bonds as shown by the brackets. Amino acid sequence identity is <30% between members of the four major chemokine groups, but ranges from ∼30 to 99% among members of the same group, indicating separate evolutionary histories. 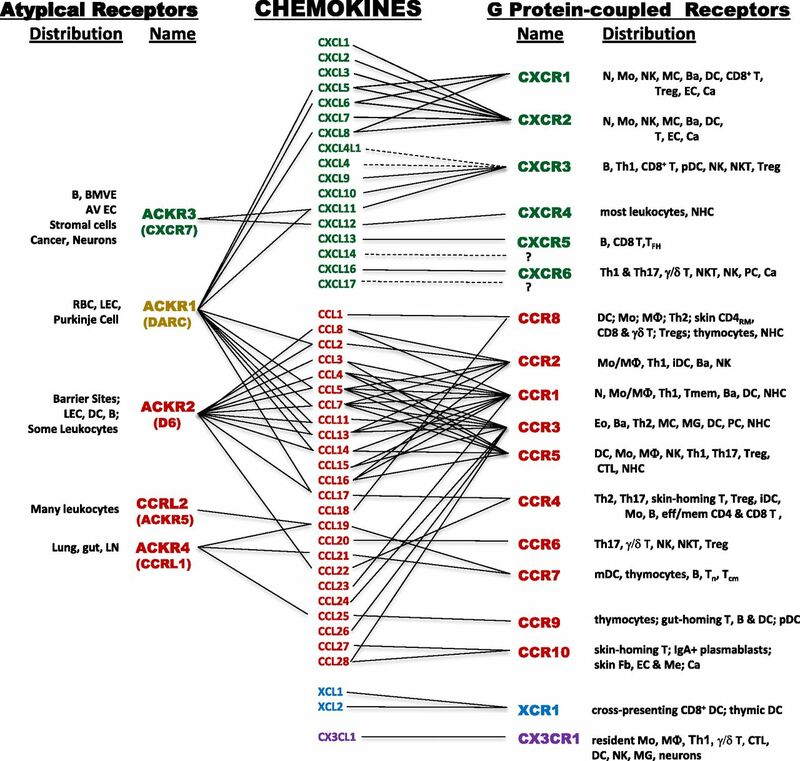 Most chemokine receptors are restricted by group. Most neutrophil-targeted chemokines are in the CXC group, and most monocyte/macrophage-targeted chemokines are in the CC group. 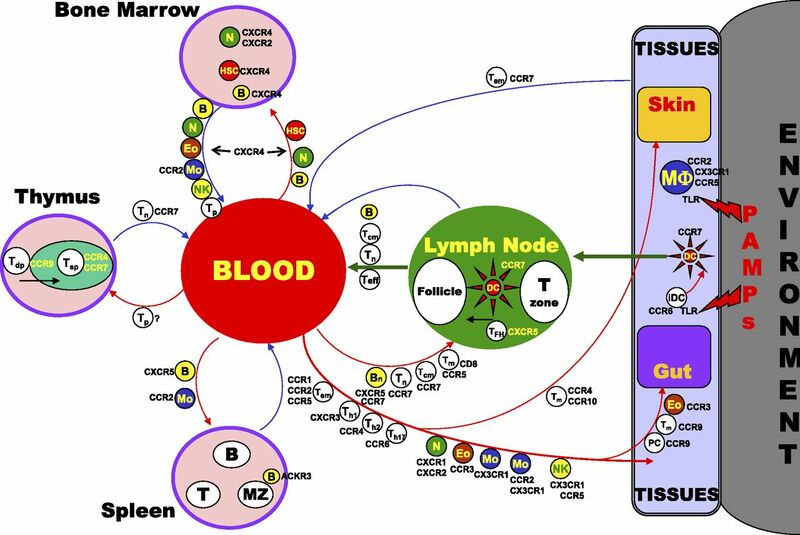 Major T and B-cell-targeted chemokines can be found in both groups. The leukocyte target specificity of a chemokine may be narrow or broad and is defined by the expression pattern of its cognate receptor(s). Tertiary structure of chemokines, chemokine receptors, and soluble chemokine-binding proteins. Chemokines have a common fold, and are presented as GAG-tethered molecules on the plasma membrane to leukocytes (upper left [Handel et al., 2005]). The chemokine core, which contains three β sheets arranged in the shape of a Greek key, is overlaid by a C-terminal α-helical domain and is flanked by an N-terminal domain that lacks order. Forced chemokine monomers are active but dimer and tetramer structures may occur, and complex quaternary structures bound to GAGs on the surface of cells may be important for function in vivo. 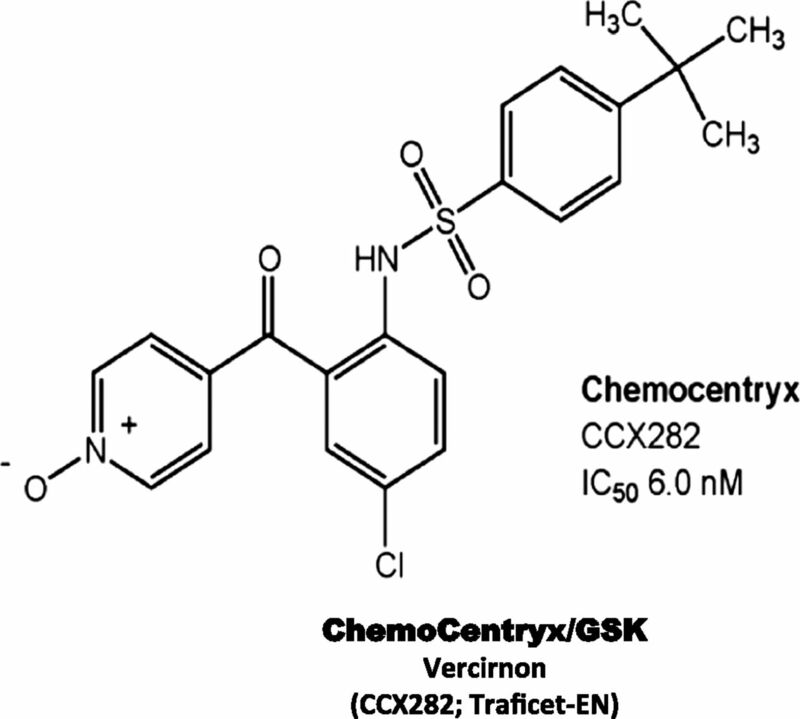 Chemokine heterodimers have been described, both CC/CC and CC/CXC. Although in separate groups as defined by cysteine motifs, CXCL16 and CX3CL1 also form a unique multimodular subgroup (upper right [Imai et al., 1997b]). The model shown for these two chemokines depicts a typical chemokine domain, a mucin-like stalk, a transmembrane domain, and a C-terminal cytoplasmic module. They can exist as membrane-bound or cleaved forms, mediating direct G protein-independent cell-cell adhesion and chemotaxis, respectively. 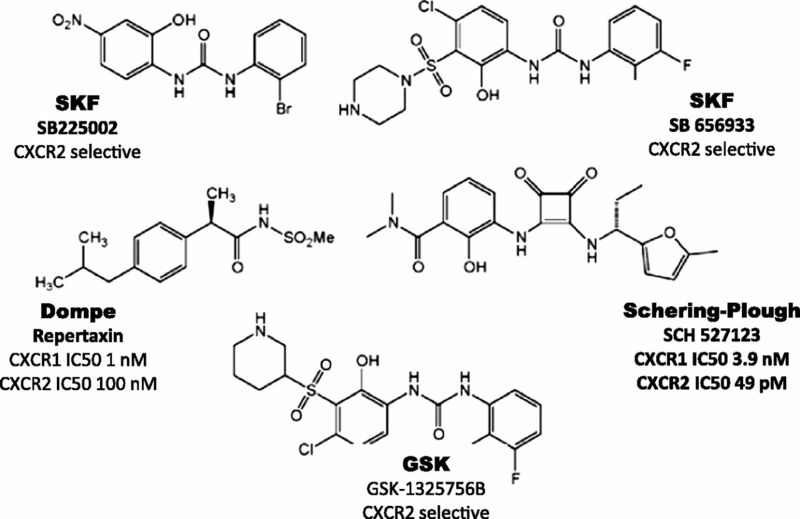 Two G protein-coupled chemokine receptors, CXCR1 and CXCR4, have been structurally defined. CXCR4 (lower left) resolves as a dimer (Wu et al., 2010). Atypical chemokine receptors, which do not appear to signal through G proteins, have not yet been defined structurally but are predicted to be 7TM proteins (lower right). Soluble chemokine-binding proteins are produced by microbes (middle left [Alexander et al., 2002]) and invertebrates (middle right [Dias et al., 2009]). The human chemokinome. 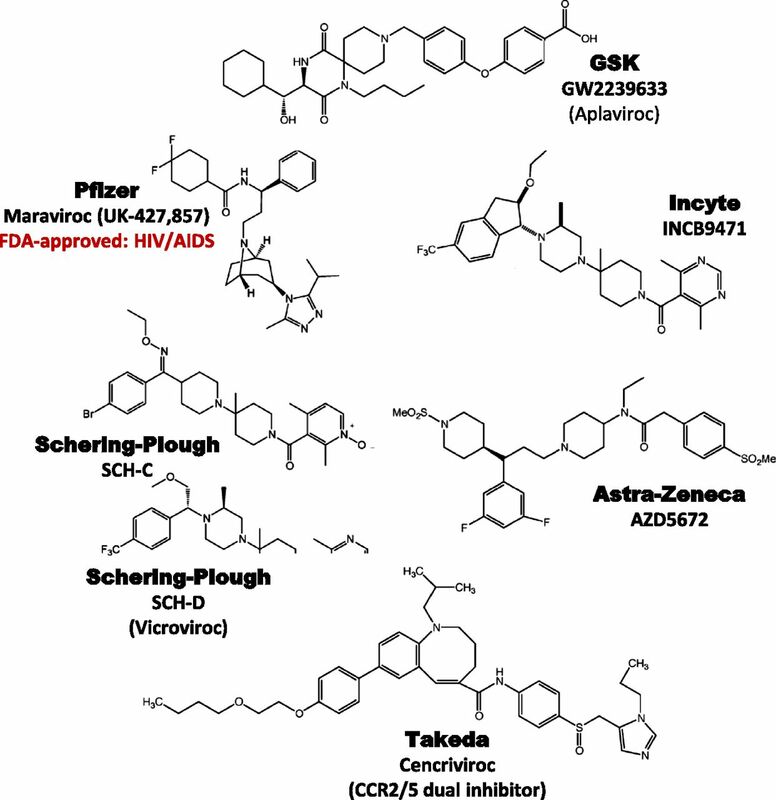 Genes for chemokines and chemokine receptors each have common ancestors but are distributed on many chromosomes. The two main chemokine gene clusters on chromosomes 4 and 17 (★) contain most of the chemokines that mediate inflammatory responses. Most inflammatory chemokine receptor genes are on chromosomes 2 and 3. 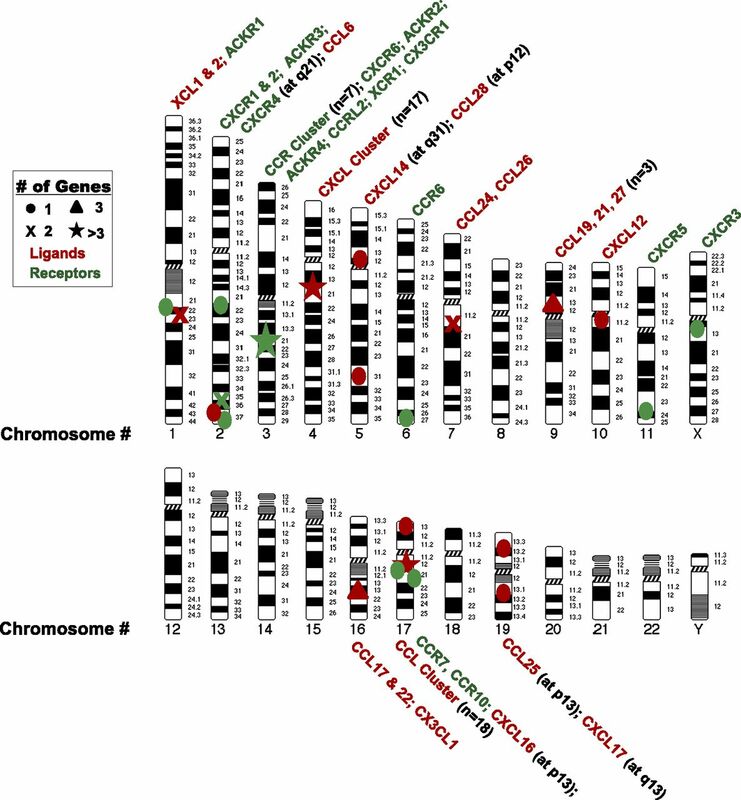 Homeostatic chemokine and chemokine receptor genes are scattered on other chromosomes. 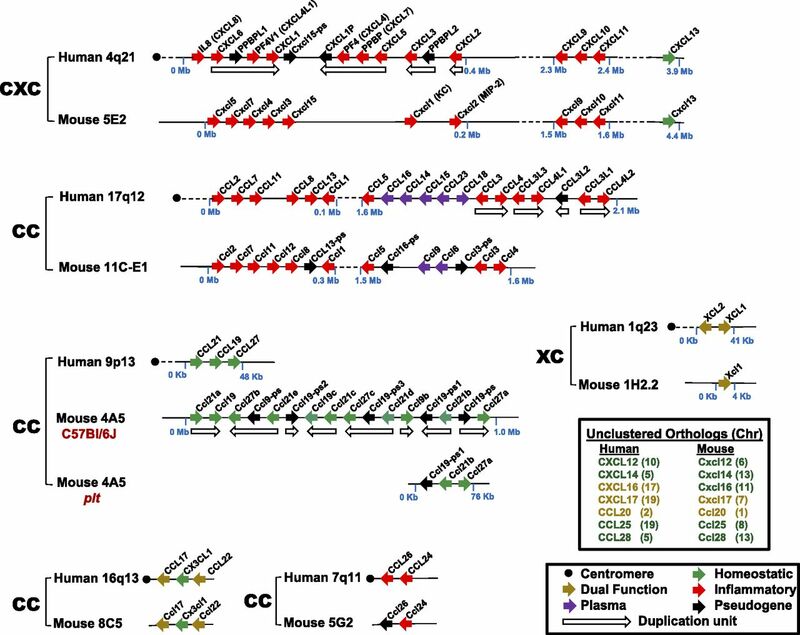 The human and mouse chemokine gene repertoires are distinct. The syntenic positions of chemokine genes located in clusters are shown schematically and aligned for mouse and human. Chromosome assignments of unclustered genes are listed in the upper box inset. See lower box inset for functional codes. Updated and modified from Nomiyama et al. (2010). Structural relationship of chemokine ligand and receptor proteins in mouse and human. See color code in box inset at the bottom middle. 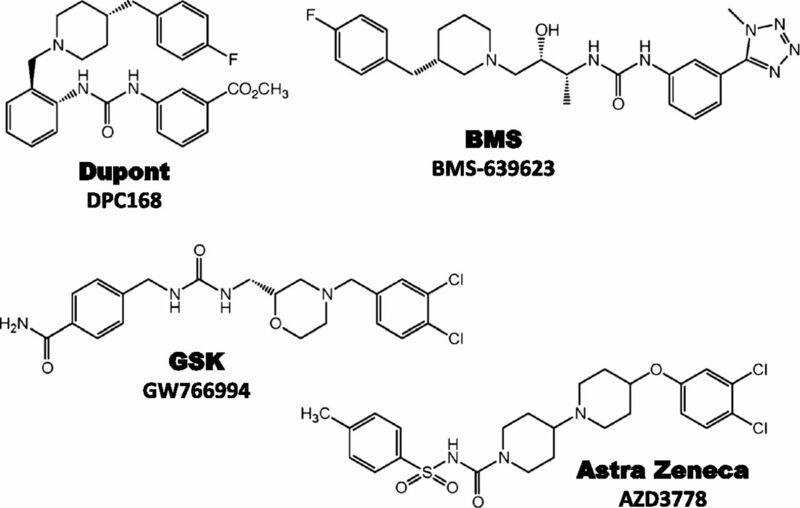 Structures and disease indications are listed above and below, respectively, the names of marketed drugs acting at the three indicated receptors. Dendrograms prepared by S. Tsang, National Institute of Allergy and Infectious Diseases, National Institutes of Health. 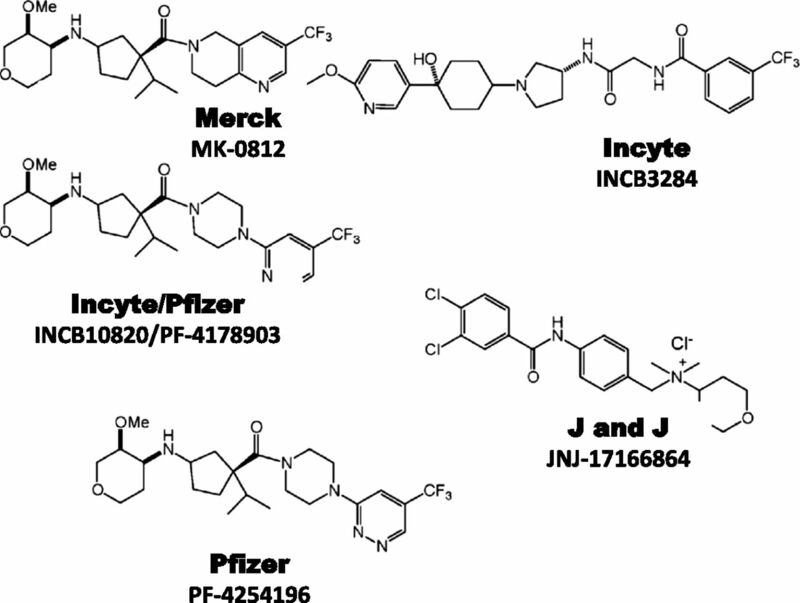 Chemokine receptor specificity for ligands and leukocytes. Abbreviations: Ba, basophil; Ca, cancer; CD4RM, resident memory CD4 T cell; EC, endothelial cell; Eo, eosinophil; Fb, fibroblasts; iDC, immature DC; MC, mast cell; Me, melanocyte; MG, microglial cell; Mo, monocyte; MΦ, macrophage; N, neutrophil; NHC, nonhematopoietic cells; PC, plasma cell; pDC, plasmacytoid DC; Tcm, central memory T cell; Th1, type 1 helper T cell; Tn, naive T cell; eff/mem, effector/memory; thym, thymocytes. 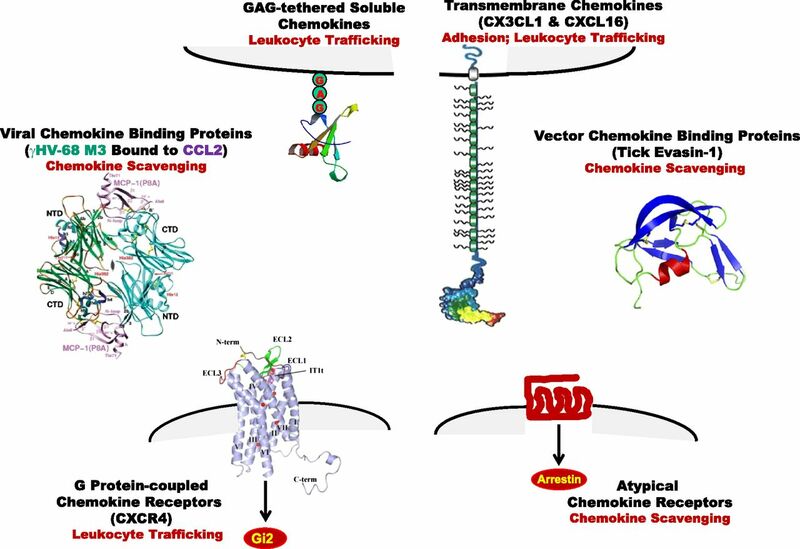 Chemokine receptors important in leukocyte trafficking pathways. Arrows demarcate major leukocyte traffic routes between major tissue and hematopoietic compartments. Cells along the arrows identify some of the cells that follow these routes. The receptors listed for each cell either mark the cell or are used by the cell for trafficking on the route shown. Abbreviations: HSC, hematopoietic stem cell; Tem, effector memory T cell; Teff, effector T cell; Tdp, double positive thymocytes; Tsp, single positive thymocytes; TFH, follicular help T cells. Clinical candidates active at CXCR1 and CXCR2. Clinical candidate active at CXCR3. Clinical candidates active at CCR1. Clinical candidates active at CCR2. Clinical candidates active at CCR3. Clinical candidate active at CCR4. Clinical candidates active at CCR5. Clinical candidate active at CCR9. ↵a Stromal cell-derived factor-1 (SDF-1) α, β, γ, δ, ε and θ are splice variants of the same human gene. IP-10, interferon-induced protein of 10 kDa; I-TAC, interferon-inducible T-cell α-chemoattractant; PF, platelet factor; TECK, thymus expressed chemokine; Ag, antigen; Ba, basophil; Eo, eosinophil; GALT, gut-associated lymphoid tissue; GCP, granulocyte chemotactic protein; HPC, hematopoietic progenitor cell; Mo, monocyte; MΦ, macrophage; MC, mast cell; NA, not applicable; NAP, neutrophil-activating protein; ND, not determined; Th1, type 1 helper T cells. CCR9 CDw199 P51686 Q9WUT7 Thymopoiesis; Homing of T cells to gut. iDC, immature dendritic cell; mDC, mature dendritic cell. See Figs. 8–10 for structures of representative clinical candidates. IBD, inflammatory bowel disease; MM, multiple myeloma; RA, rheumatoid arthritis. 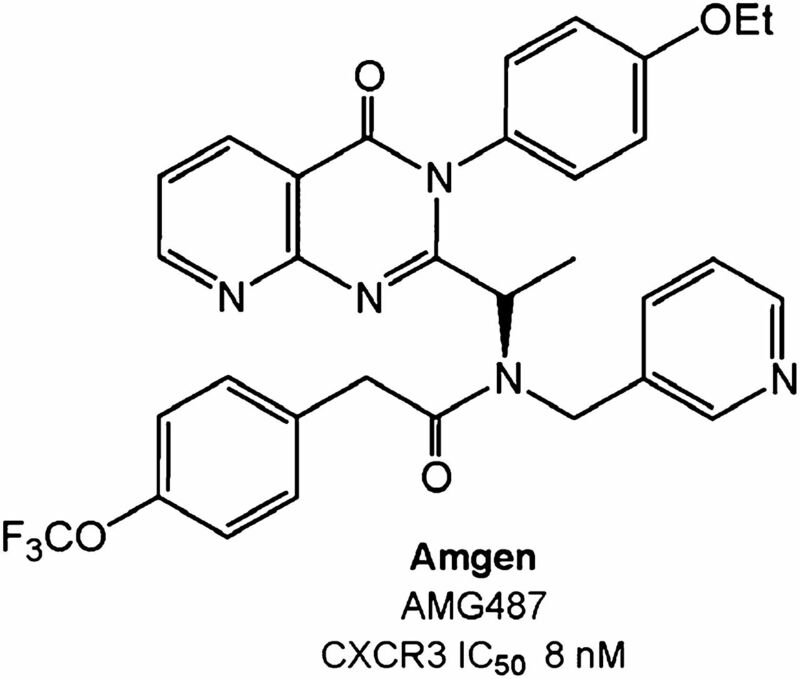 ↵e Also has potent antagonist activity at CCR2. Neutralizing monoclonal antibodies unless otherwise noted. 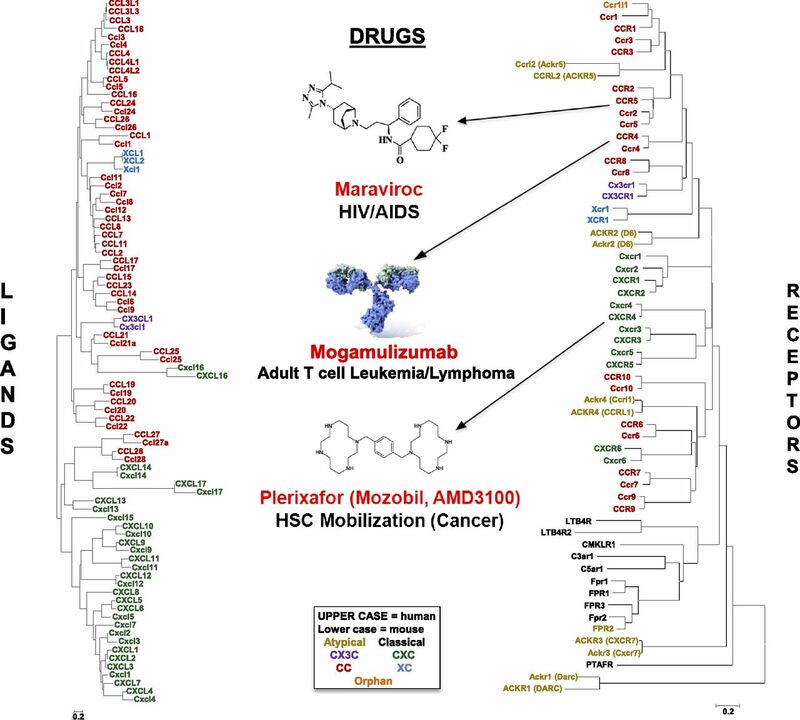 CLL, chronic lymphocytic leukemia; NA, not available. −/−, Homozygous; +/−, heterozygous; AD, autosomal dominant; GG, genotype GG; RBC, red blood cell.